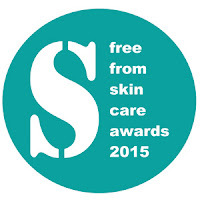 One of the awesome events I get involved with through my blog is the Free From Skincare Awards. It was really lovely to be asked back for my third year of judging. There was a switch around in the system this year, the Beauty Bible testers got their hands on products first. Usually, I have been involved in shortlisting ahead of testing. It was really interesting to work with tester feedback when judging products. Last week I helped select Gold, Silver and Bronze winners in four categories. Oh my goodness knowing the secrets I do it is so exciting and I can't wait until July when the announcements are made at the Love Natural Love Organic show on 3rd July 2015 at Olympia. To give you a bit of background, the awards were founded in 2012 to encourage and reward manufacturers of skincare products that are ‘free from’ many of the allergens, ingredients, additives and artificial fragrances associated with skin sensitivities, health concerns, as well as ethical, personal and environmental issues. Over 150 products from more than 100 skincare brands have made the shortlist of the fourth annual Free From Skincare Awards. To view the Shortlist visit www.skinsmatter.com. Neal’s Yard Remedies lead the way with five shortlisted products, followed by four brands with four shortlisted products – Ayumi, Botanicals, JustBe Botanicals and Zk’in. Thanks for letting us know about this, I'd never heard of the awards before but I may be at the LNLO event so hopefully I'll catch the announcement of the winners!